b. The members of the Development Committee shall be governors of the Bank, governors of the Fund, ministers, or others of comparable rank. c. The members of the Development Committee shall be appointed for successive periods of two years by the members of the Bank or the members of the Fund, with the appointments to be made by the members of the institution that has the larger number of executive directors or, if the number of executive directors at the Bank and the Fund is the same, by the members of the institution that did not appoint the previous members of the Development Committee. d. Each member government of the Bank or the Fund, as the case may be, that appoints or elects an executive director and each group of member governments of the Bank or of the Fund, as the case may be, that elects an executive director shall appoint one member of the Development Committee and up to seven associates, and, for any meeting when the member of the committee is not present, may appoint an alternate with full power to act for the member at such meeting. e. Each member and associate shall serve until a new appointment is made by the member government or member governments of the Bank or the Fund, as the case may be, that are entitled to make the appointment or until the next succeeding regular election of executive directors, whichever is earlier. f. During the periods when appointments are made by members of the Bank, a member of the Bank whose membership has been suspended pursuant to Article VI, Section 2 of the Articles of Agreement of the Bank shall not appoint or participate in the appointment of a member of the Committee, his alternate and associates. When the membership of a member of the Bank is suspended, and when a suspended member is restored to good standing, the consequences on the Executive Director of the Bank appointed or elected by such member, or in whose election such member participated, shall apply to the member of the Committee, his alternate and associates appointed by that member of the Bank, or in whose appointment such member participated. g. During the periods when appointments are made by members of the Fund, a member of the Fund whose voting rights are suspended pursuant to Article XXVI, Section 2 (b) of the Articles of Agreement of the Fund shall not appoint, or participate in the appointment of, a member of the Committee, his alternate and associates. When the voting rights of a member of the Fund are suspended, the rules in Schedule L, paragraph 3(c) of the Articles of Agreement of the Fund on the termination of office and replacement of executive directors shall apply to the member of the Committee, his alternate and associates appointed by that member of the Fund, or in whose appointment such member participated. a. Members of the Development Committee, associates, and the executive directors of the Bank and the Fund, or in their absence their alternates, shall be entitled to participate in meetings of the committee, unless the Committee decides to hold a session restricted to members, the President of the Bank, and the Managing Director of the Fund. Participation in respect of each item on the agenda of a meeting shall be limited to one person in respect of each member government or group of member governments that appoint a member of the Committee. 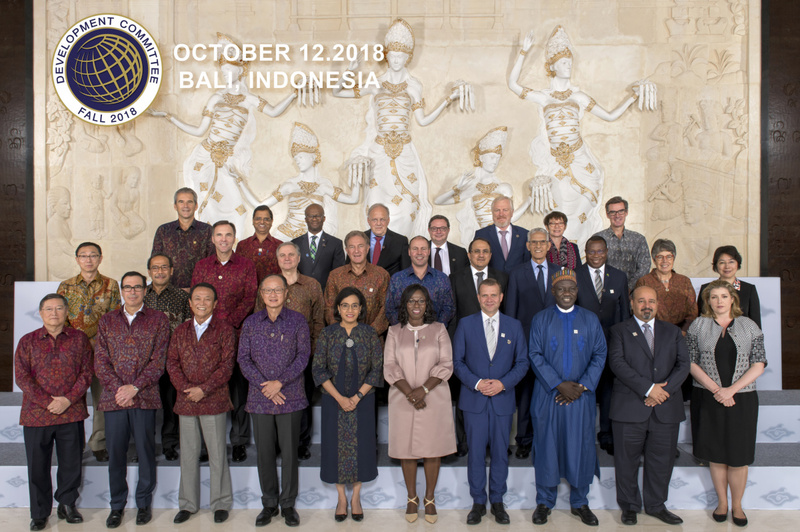 c. The Development Committee shall invite the heads of other international financial or economic organizations, as well as other persons, to attend or participate in meetings of the Committee relating to their areas of responsibility. a. 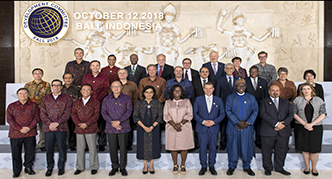 The Development Committee shall maintain an overview of the development process and shall advise and report to the Boards of Governors of the Bank and the Fund on all aspects of the broad question of the transfer of real resources to developing countries, and shall make suggestions for consideration by those concerned regarding the implementation of its conclusions. The Committee shall review, on a continuing basis, the progress made in fulfillment of its suggestions. c. The Development Committee shall give urgent attention to the problems of (i) the least developed countries and (ii) those developing countries most seriously affected by balance of payments difficulties in the current situation. a. The Development Committee shall meet at the time of the annual meetings of the Boards of Governors of the Bank and the Fund and, in addition, as often as required. The Chairman may call meetings after consulting the members of the Committee and shall consult them on calling a meeting if so requested by any member of the Committee. b. A quorum for any meeting of the Development Committee shall be two-thirds of the members of the Committee. c. The Development Committee may establish sub-committees or working groups from time to time. d. The Committee shall appoint an Executive Secretary, who shall be entitled to participate in all Committee meetings. The Executive Secretary, supported by a small staff as necessary, and drawing on the staffs of the Bank and the Fund to the maximum extend feasible, shall be responsible to the Committee for carrying out the work directed by the Committee. e. Appropriate arrangements shall be made for the coordination of the work of the Development Committee and the work of the Executive Directors of the Bank and the Fund. f. The President of the Bank and the Managing Director of the Fund shall arrange to carry out technical work requested by the Committee and provide administrative support for the Committee within the competence of their organizations. g. The Committee may request assistance from international organizations or other bodies or individuals in connections with the preparation of its work. h. In reporting any suggestions or views of the Development Committee, the Chairman shall seek to establish a sense of the meeting. In the event of a failure to reach a unanimous view, all views shall be reported, and the members holding such views shall be identified. i. The Development Committee shall report not less than once a year to the Boards of Governors on the progress of its work and may publish such other reports as it deems desirable to carry out its purposes. j. The Development Committee may determine any aspect of its procedure that is not established by this Resolution. IMF Governors Resolution 29-9, October 2, 1974.